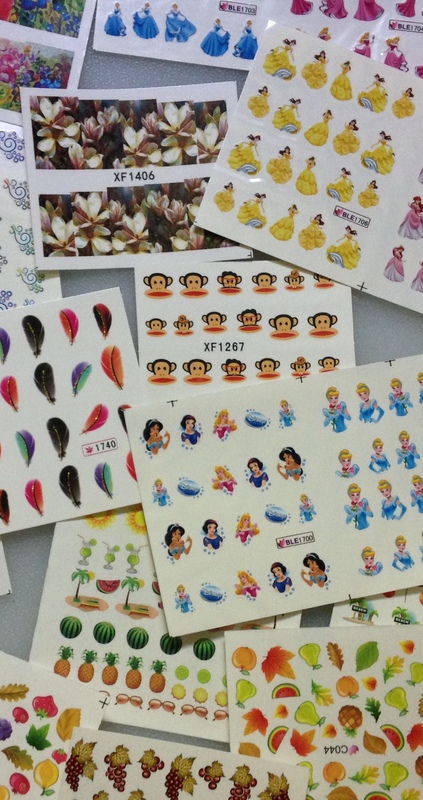 Nail Art and Fun, Judgement Free! I began by painting all of my nails with Sally Hansen Xtreme Wear Celeb City. 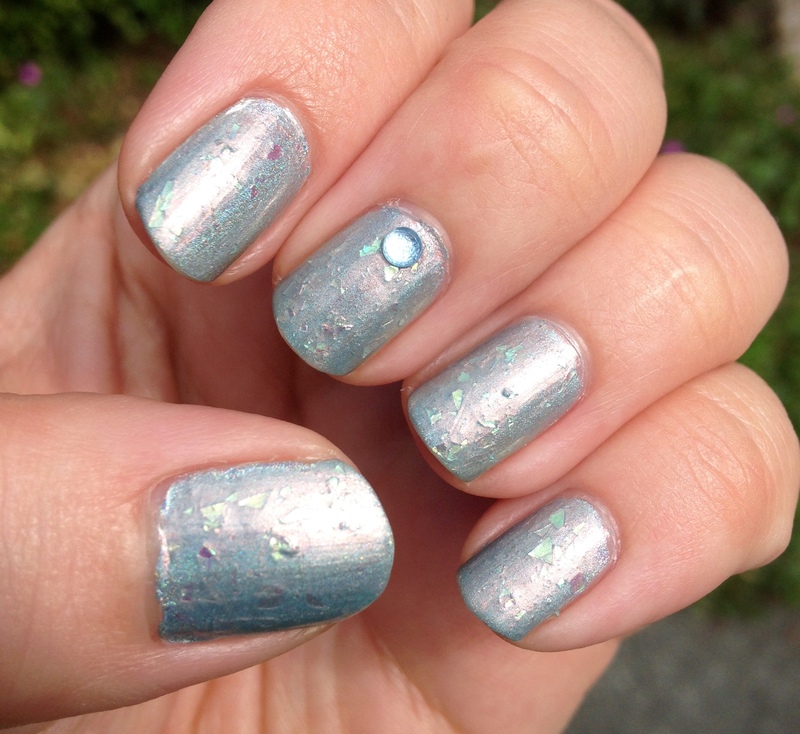 This is hands down, my favorite silver polish. I actually like it underneath the Color Paints much better than the polish that OPI released with them. After the silver base dried, I painted all of my nails with one coat of OPI Color Paints Purple Perspective. After that dried, I used a Bundle Monster plate, Konad stamper and scraper, and white stamping polish from the Born Pretty Store. 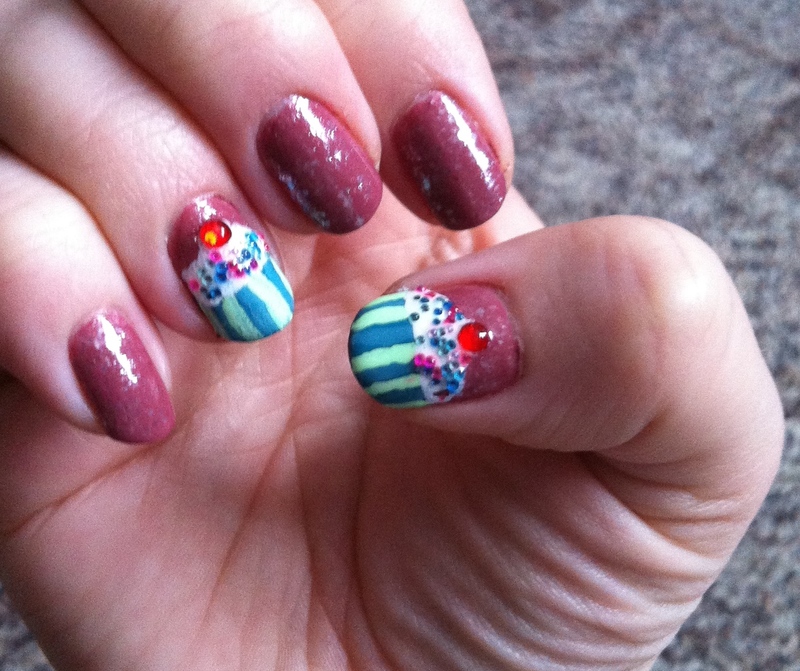 I chose the rose type of image and stamped all of the nails with white. 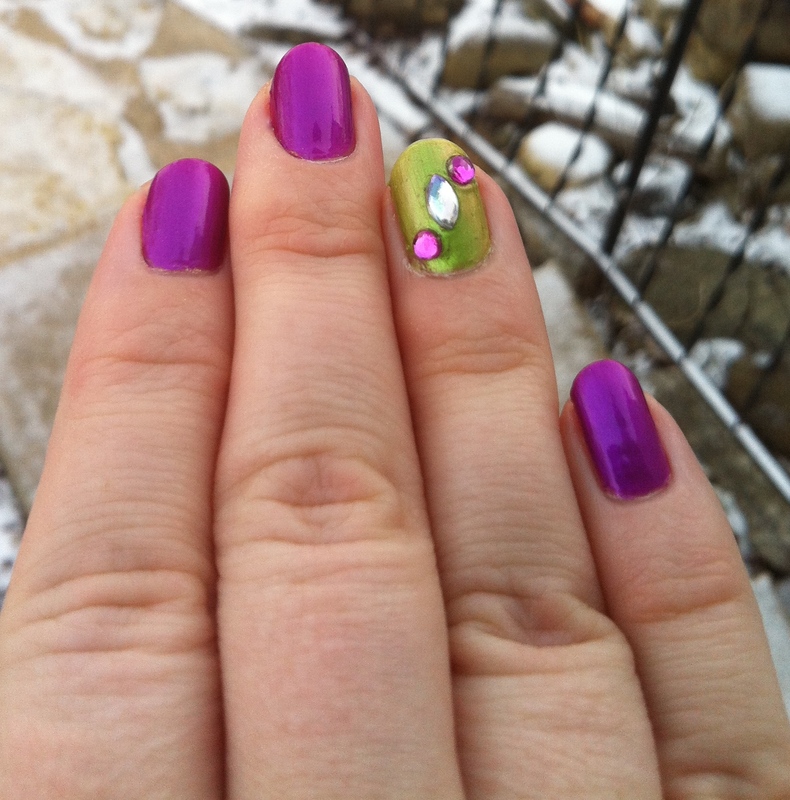 Originally, I was going to leave my nails purple and white to match the bouquet, but I thought it was too much, and that’s where the OPI Sheer Tints Don’t Violet Me Down (pictured above) came into play. One coat of that over all of the nails toned down the white perfectly. 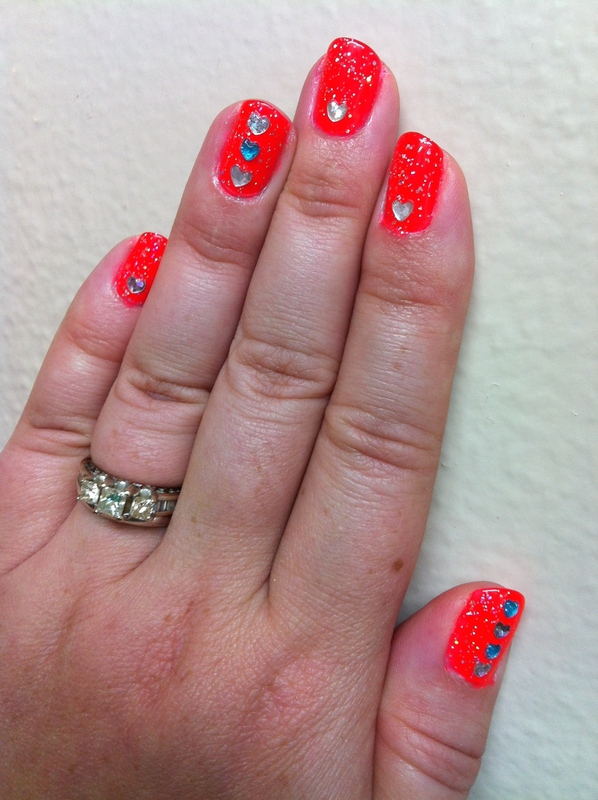 And, as a subtle accent, I used a heart rhinestone on each of my ring fingers. Thanks for reading! Come back soon! Do you ever get the urge to spend money, but know you really shouldn’t? I had that feeling one night, when I couldn’t sleep, so I hit eBay. Not one particular seller to brag on, just excellent prices and finds! Seriously, I got all of this stuff for less than five dollars and free shipping! I got eight new wheels full of stuff. 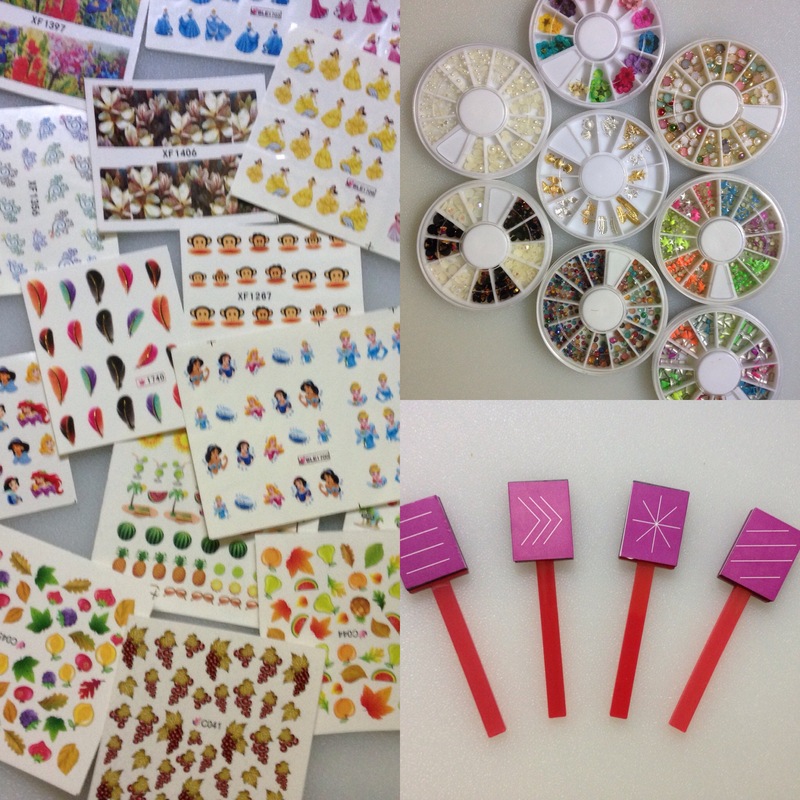 I also snagged up these nail art magnets. I have’t tried them yet to know how well they work, but the idea of them and the price made them worth a go. 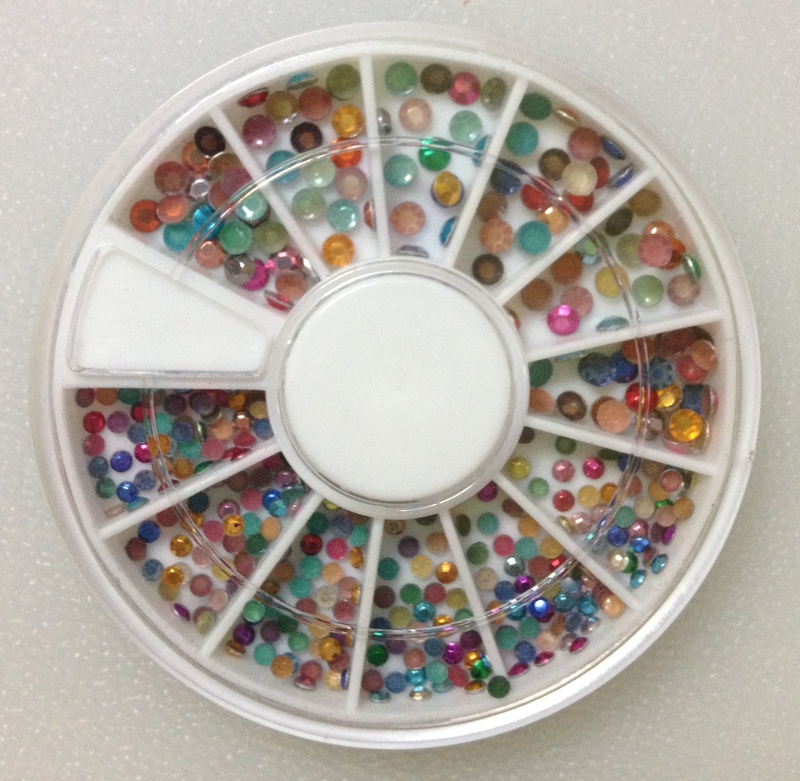 In closing, I would completely recommend eBay as a shopping source for nail art stuff. Especially if you really don’t want to spend money (or shouldn’t spend money) it lets you feel like you got a bunch of stuff for nothing! Thanks for reading! 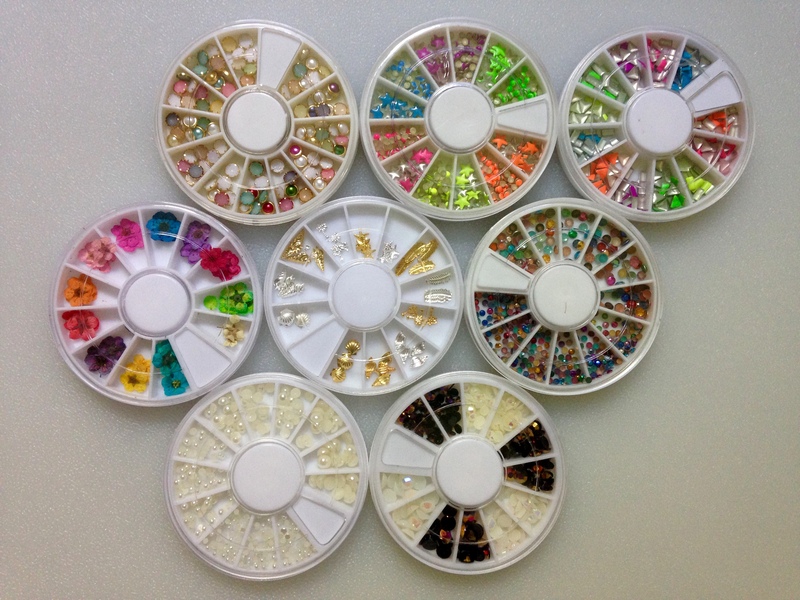 I have some nail stuff to try! After I got done painting my nails with this polish, I was reminded of Elsa from Frozen. 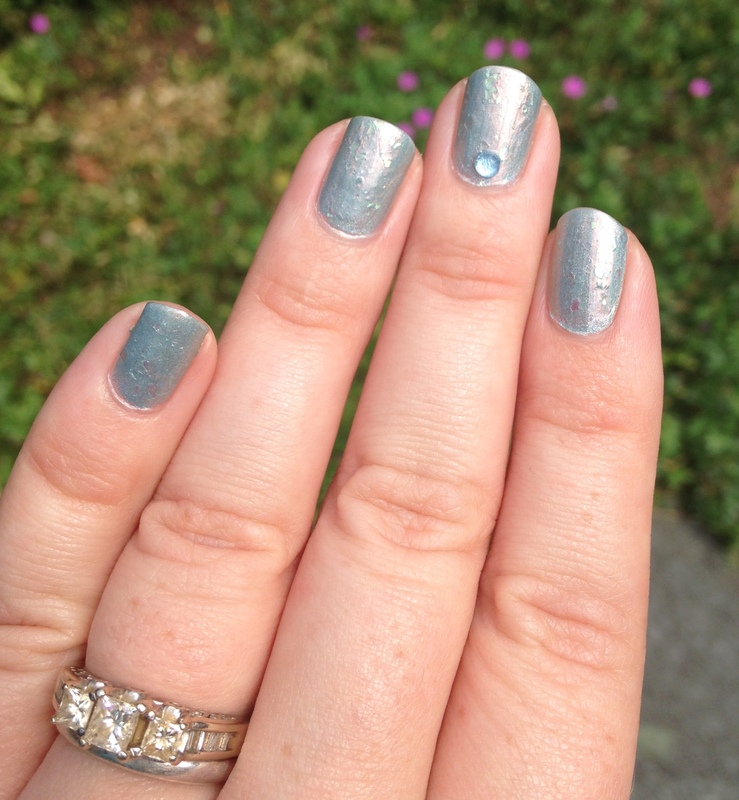 This seems like more of a winter than a summer mani, but who cares? Pretty is pretty, no matter what season it is. All I needed for this look were these two things. I used blue gems out of one of my rhinestone wheels and Julep Luna. I tried to zoom in a little on the polish so you can see how flipping magnificent it is! 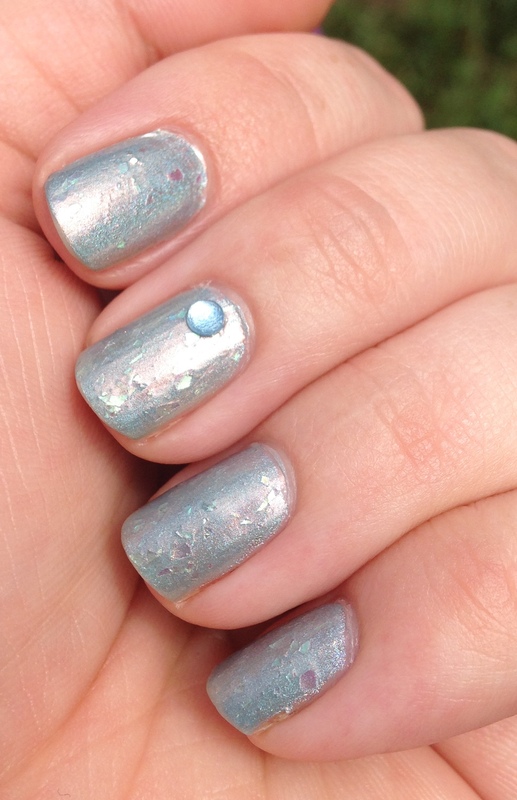 It is light blue, with large (I call them ice chip) glitters in them. 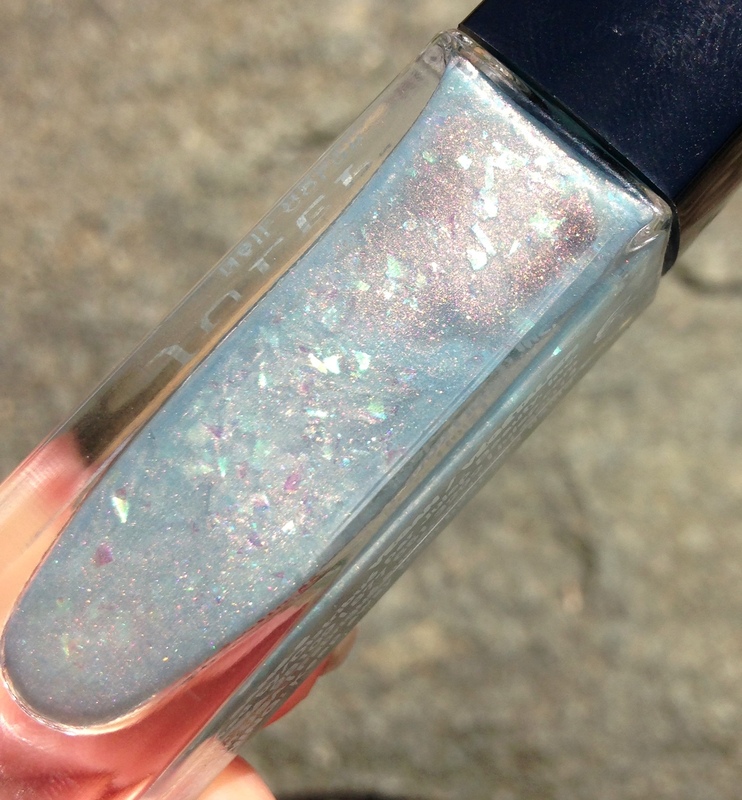 The polish has an iridescent shine that is also fabulous. And surprisingly, for such a light colored polish, two coats really did the trick. This look was super simple, and I really liked it. I loved all of the different colors that the polish would shine and the single accent gem added just enough to have flare, but not over the top. 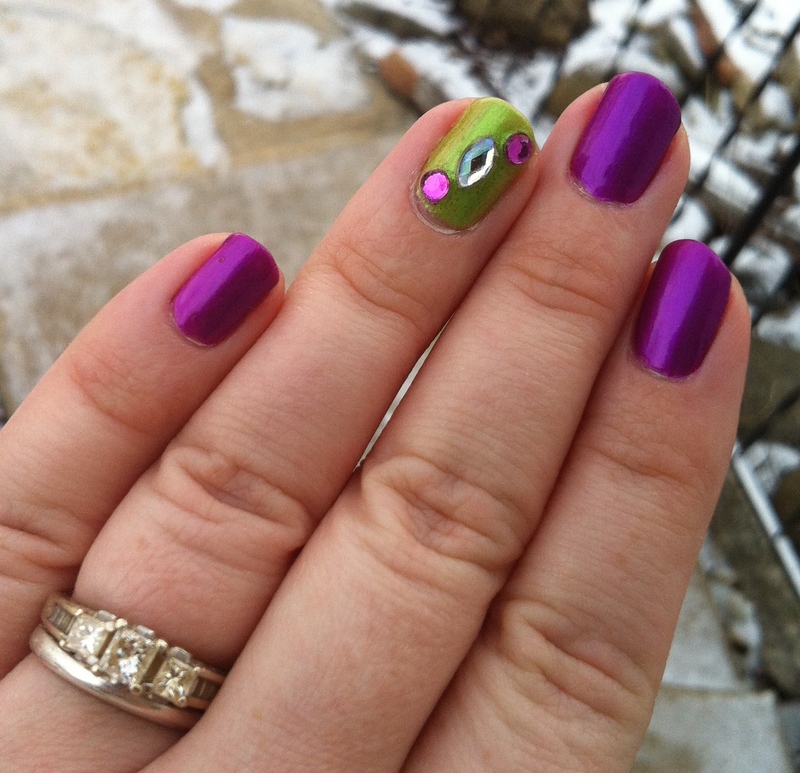 I was experimenting with polishes and when this look came together, I thought, whoa Mardi Gras! I should have made this combo then, rather than at the tail end of Lent. Oh well….I’ll remember it for next year. These are the two polishes that I used. The green is Sally Hansen Miracle Gel Super Charge. This one took about three coats, and I wasn’t that patient in between so I got some bubbling. The purple is Sally Hansen Miracle Gel Hunger Flames. This one was solid in two coats. Both go on fairly easily. Before the top coat, they looked a little streaky, but the top coat took that out. 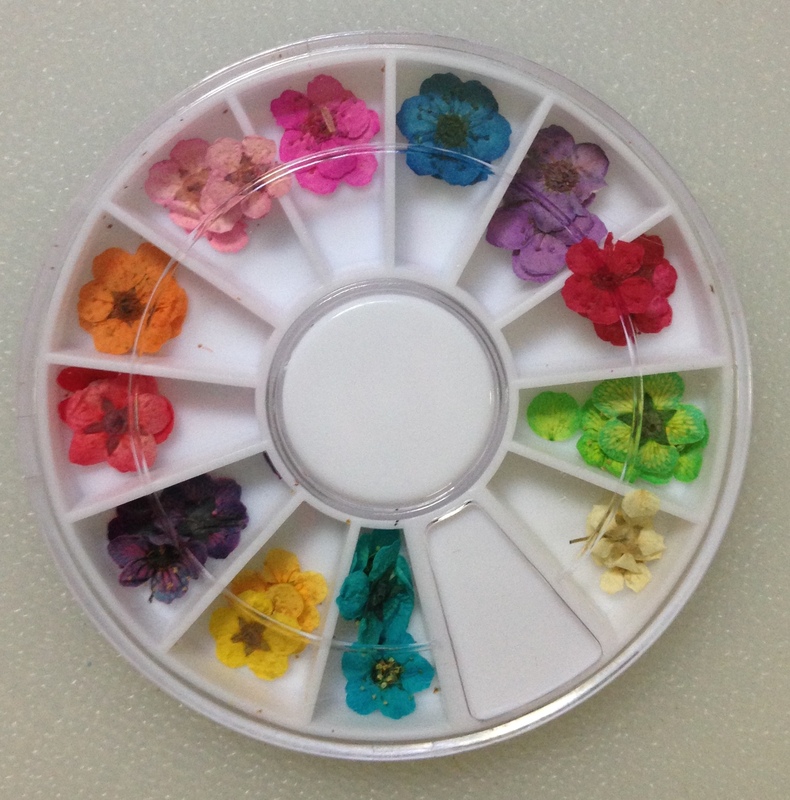 I have a wheel of mixed gems that I took my jewels from. 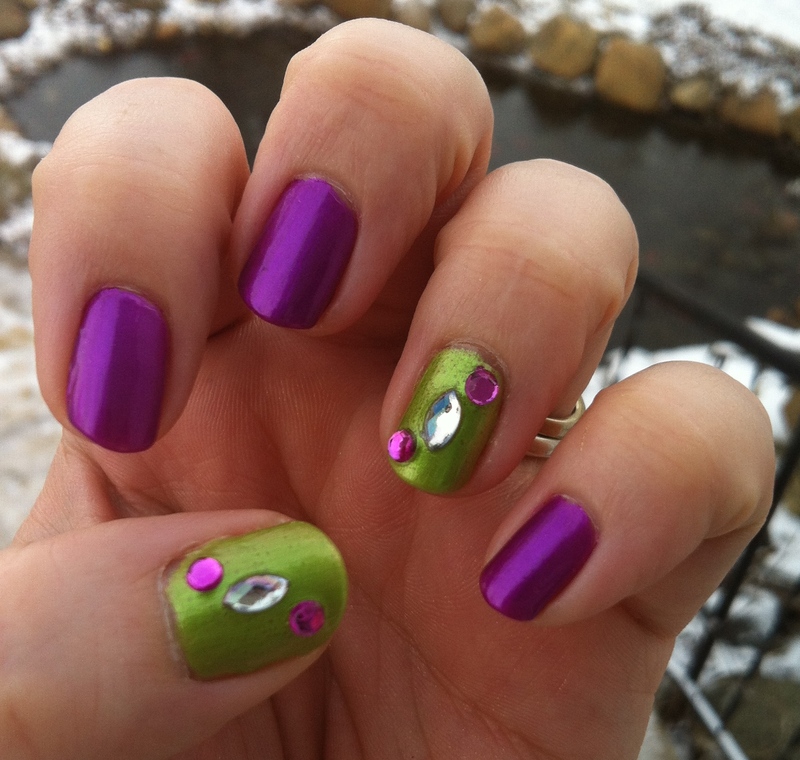 I used an oval holo gem and a purple gem that matched almost perfectly. They were bigger than I would usually like, so the whole time I was wearing this I felt bulky. 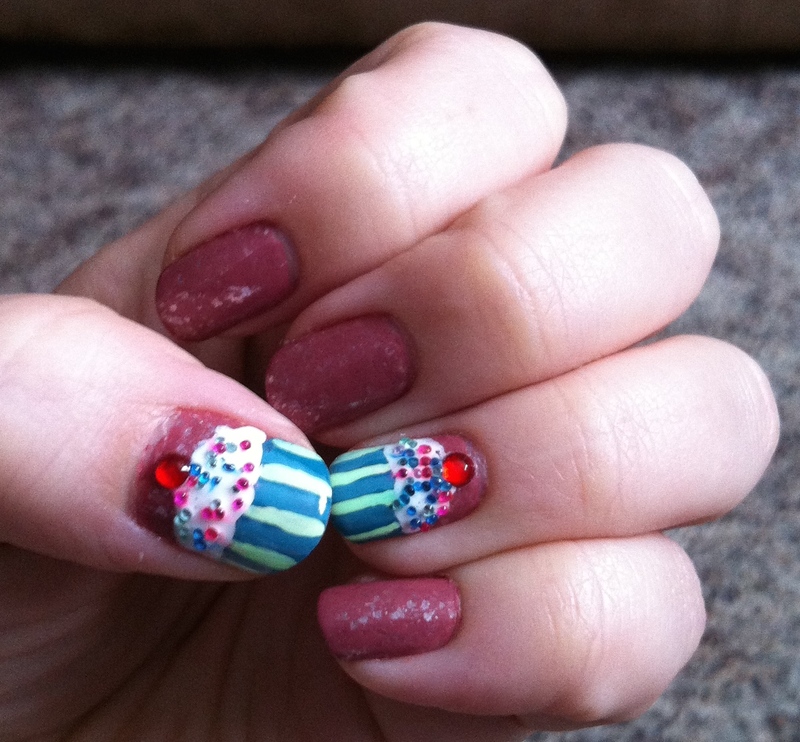 I attached them with the special top coat for the Miracle Gel and that worked just fine. Does anyone else seem to find that if you top coat gems they lose some of their shine? But, if you don’t top coat them they fall off right away. 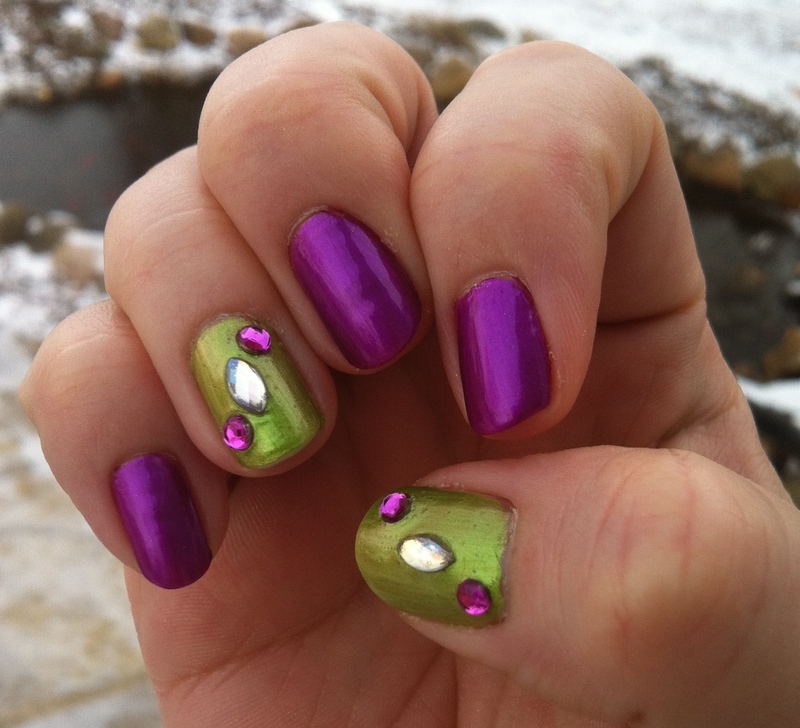 I think the color combo and gems were fun, but a little bold for everyday wear. I will have to remember this next year at Mardi Gras….there is real potential there. 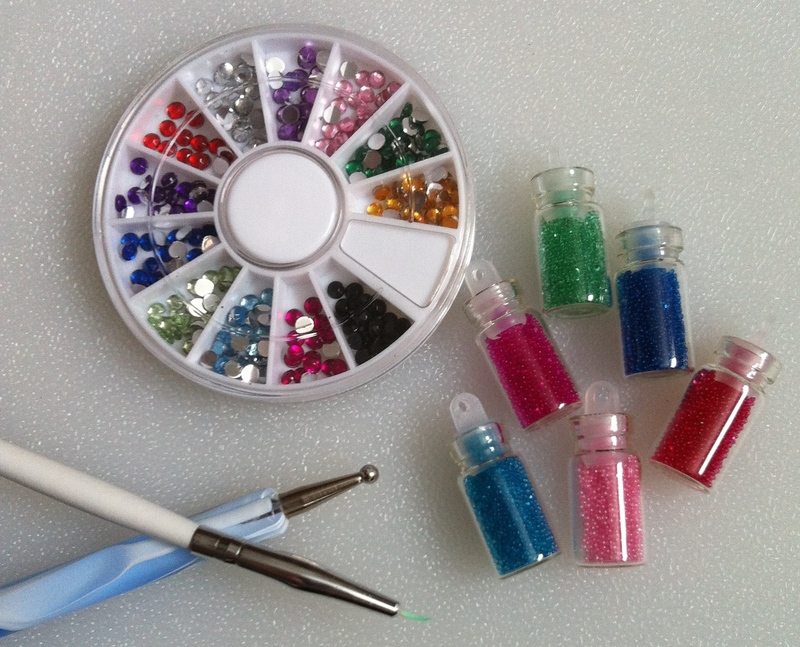 Six (good grief) polishes, a small brush, a dotting tool, some rhinestones, and caviar beads. First, I began with a layer of Sally Hansen Xtreme Wear Mauve Over on all of my nails. This is for two reasons. One, it seems fairly neutral, and two I just got it from their new collection and was itching to try it. 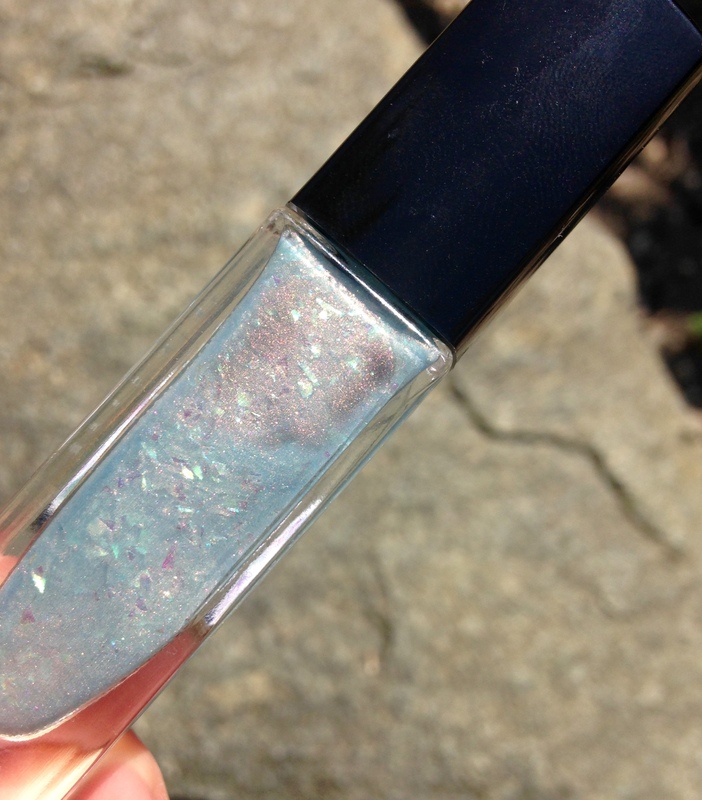 Like other Xtreme Wear polishes, it is easy to use and was opaque in two coats. Then, since I knew I would be spicing up two nails on each hand, I felt like the others needed something, but I didn’t want to get crazy with it since the mauve color was so neutral. That’s where Sally Hansen Diamond Strength Glass Slipper came into play. Glass Slipper is made up of these very sheer, flaky glitter pieces. Honestly, the two worked together nicely. The glitter gave the mauve a little pop, but let it keep its neutrality. Okay, so then that dried and I chose my colors for the cupcakes. I almost went with pinks and purples, but I wanted them to pop, so I went in the complete opposite direction with some blues and green. 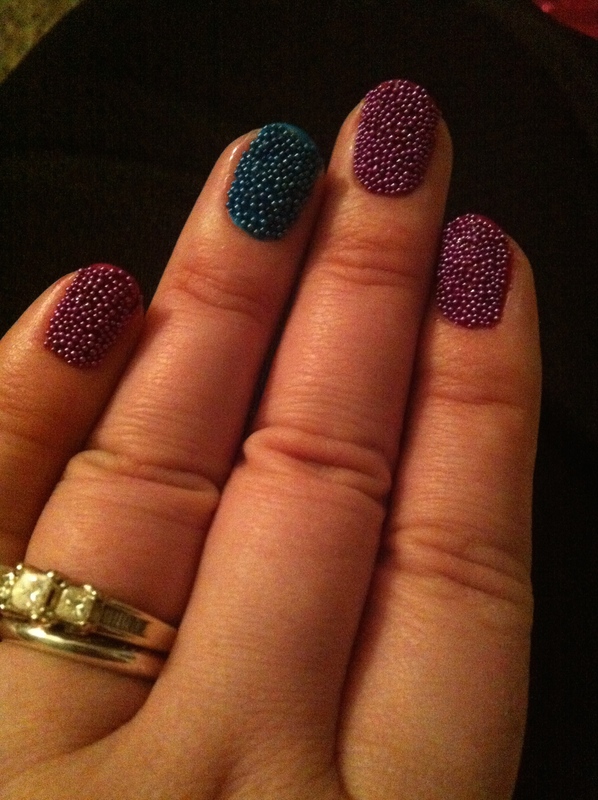 On my thumb and ring finger, I began with the Sally Hansen Velvet Texture Plush. 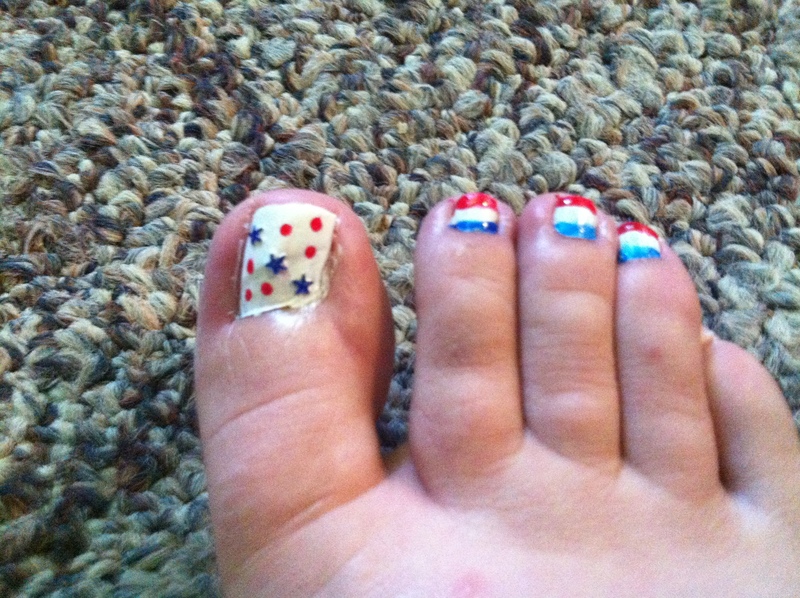 I painted about a third of my nail. I used two coats of this to make sure the mauve was covered up. This was a nice one to use because when it dries it is textured, so it was very easy to tell when I could move on to the next coat. Then, I used the small brush to paint some slightly lighter blue lines with Covergirl Outlast Glosstini Blue Hawaiian. The color difference was very subtle, but enough to give a small highlight. In addition, it was nice to have that glossy finish, where the velvet wasn’t. After that I went back in with the small brush and made stripes of the Fresh Paint Honeydew. This is a really bright, beautiful green that worked with the blue well and brought a lot of pop! That took care of the cupcake wrappers. Next, it was time to frost those bad boys! I put a glob of Sally Hansen Xtreme Wear White On above the wrapper part of the design and used the fat end of the dotting tool to spread it around. I liked that for the ease and the thick, frosting look it achieved. I do think you could get a cuter, more precise look if you just used the dotting tool the way you are supposed to. While the white was wet, I sprinkled on the caviar beads. Ahead of time, I had dropped a little of each color in a dish and mixed them up. I had considered placing each piece to get a more precise look, but I was running out of time and patience, so sprinkling was the chosen method. 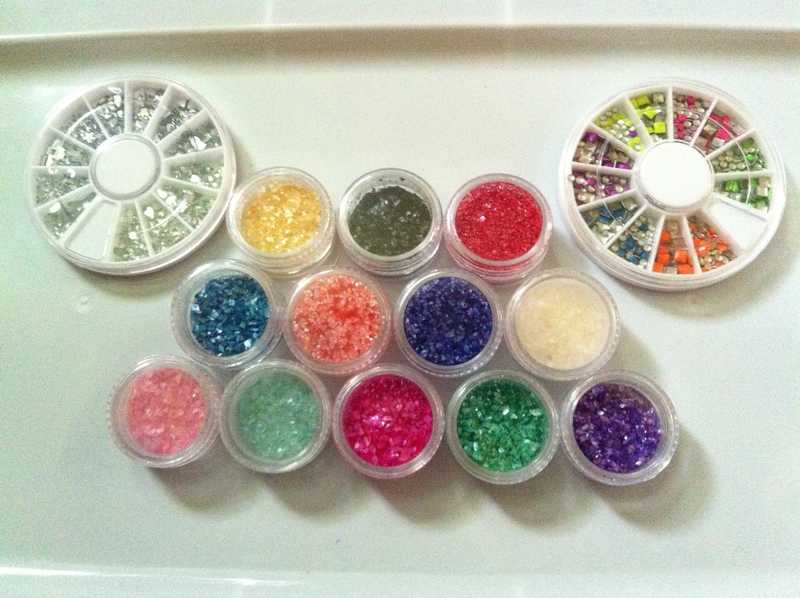 Here is a question though…do your caviar beads smear all of the time? I purposely chose to use these because they aren’t coated (or so I thought) and I figured the color wouldn’t bleed, but I still ended up with a little smearing. 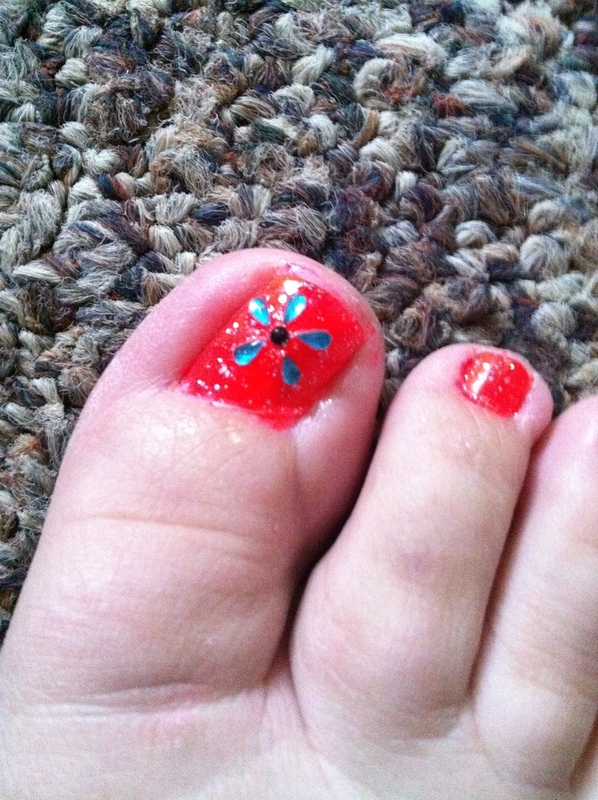 Then, finally, I used a little clear coat and a red rhinestone to put the cherry on top! Overall, I am happy with it and I thought it was a fun way to celebrate. Here is the third installment of my Amazon haul. I love getting something in the mail that isn’t a bill or junk, and when it is from my Amazon frenzy a couple weeks ago, I love it even more! 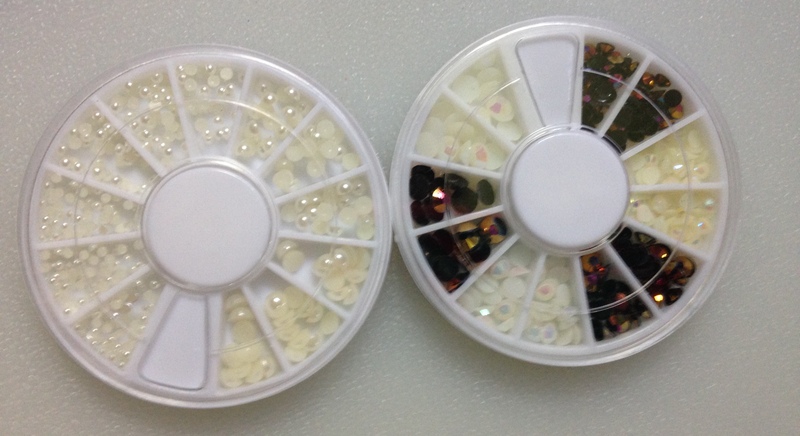 First, I got my clear rhinestones. 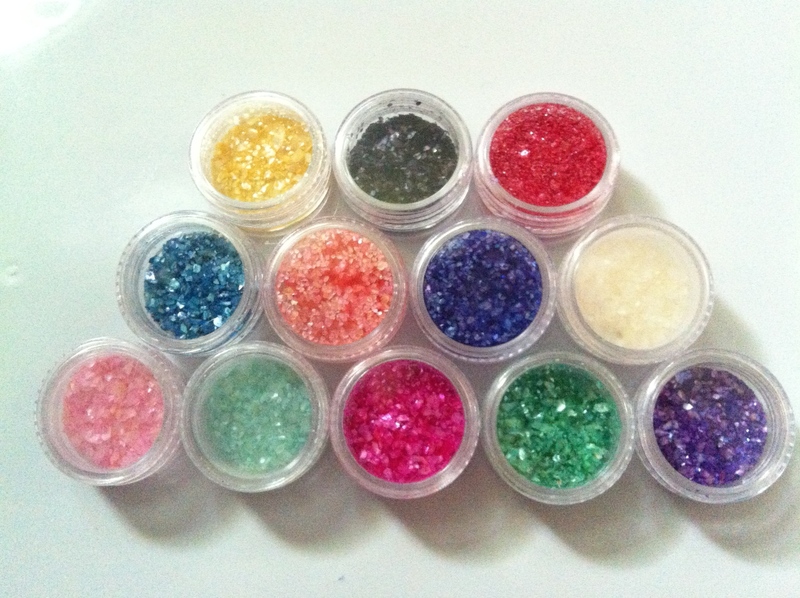 I use my clear stones more than any others, and I found these for 69 cents, free shipping. 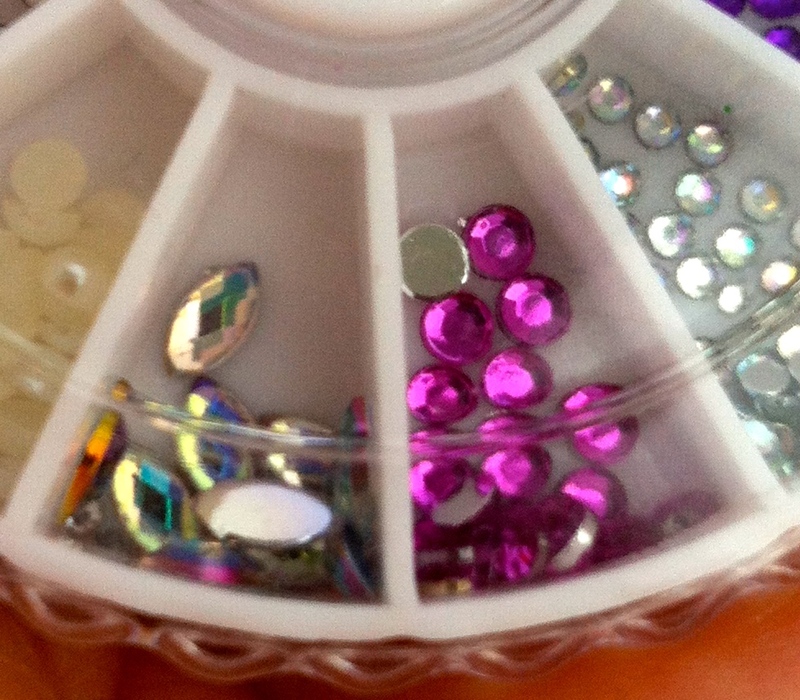 The reviews on them were mixed, but I wasn’t expecting Swarovski for that price. I am pleased with them. 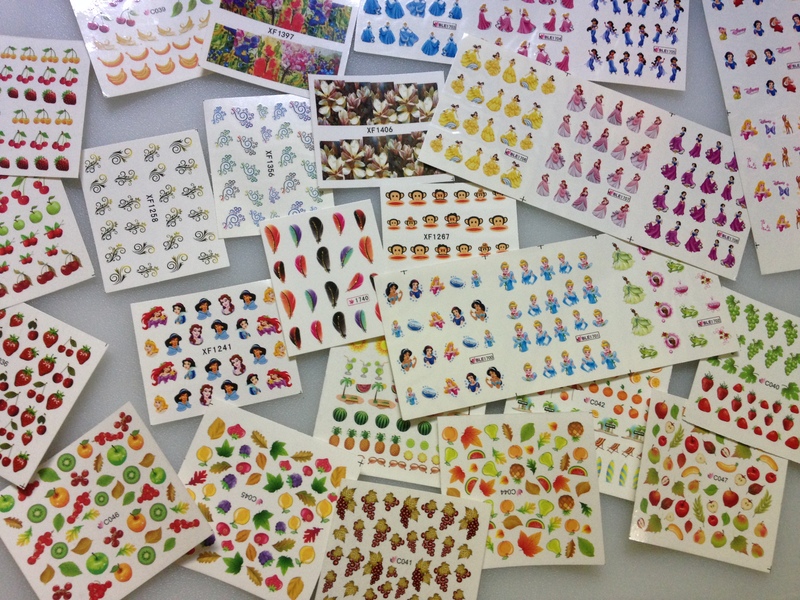 They came in ovals, kidney bean shape, rectangles, stars, teardrops, flowers, hearts, large circles, squares, bent teardrops, hearts, and small circles. 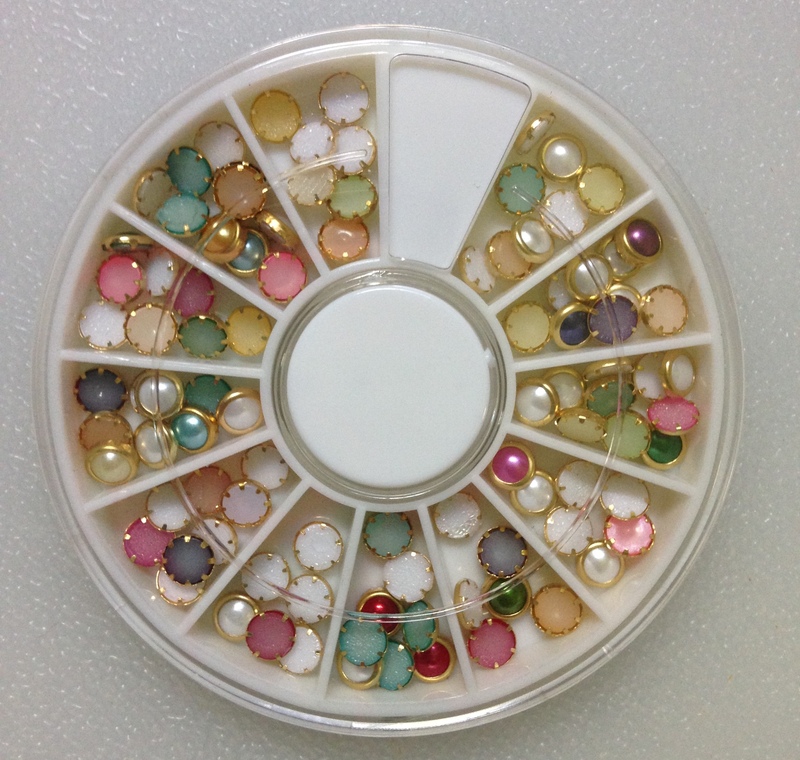 There are lots in each compartment, and they will be great for all kinds of designs. 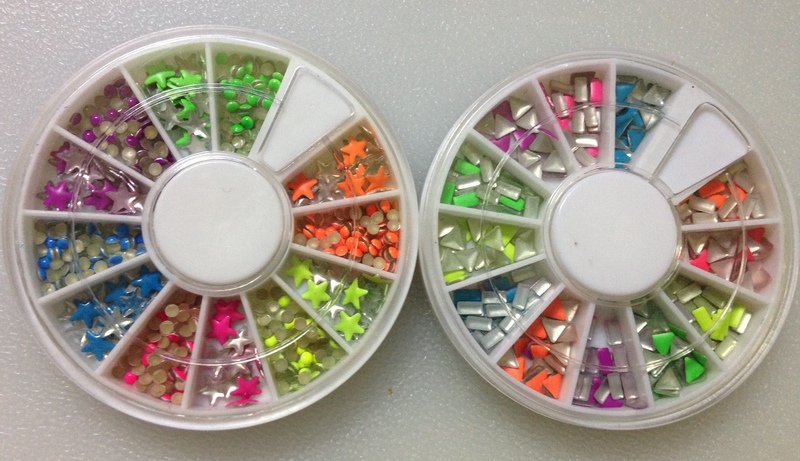 Second, I got my neon studs. 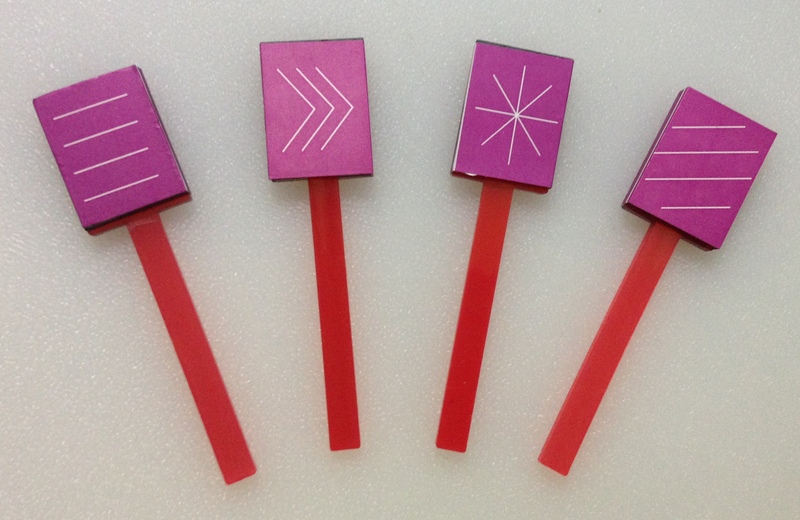 There are circles and squares in each of the six colors. The colors are very vibrant in person, so don’t let the picture fool you. 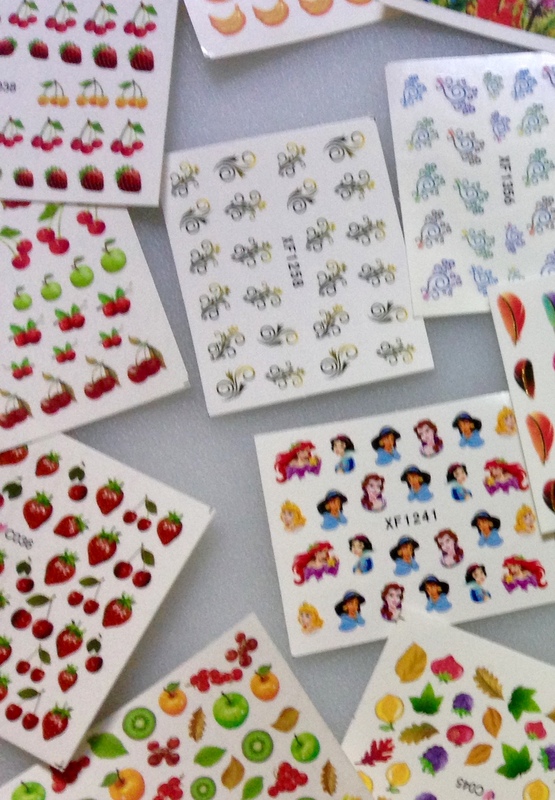 These are very thin, so I think they will be great for nail art that I want to stay, because they won’t be jutting out really far from my nails. Clearly, there are lots of color options here, between pastel and bold. 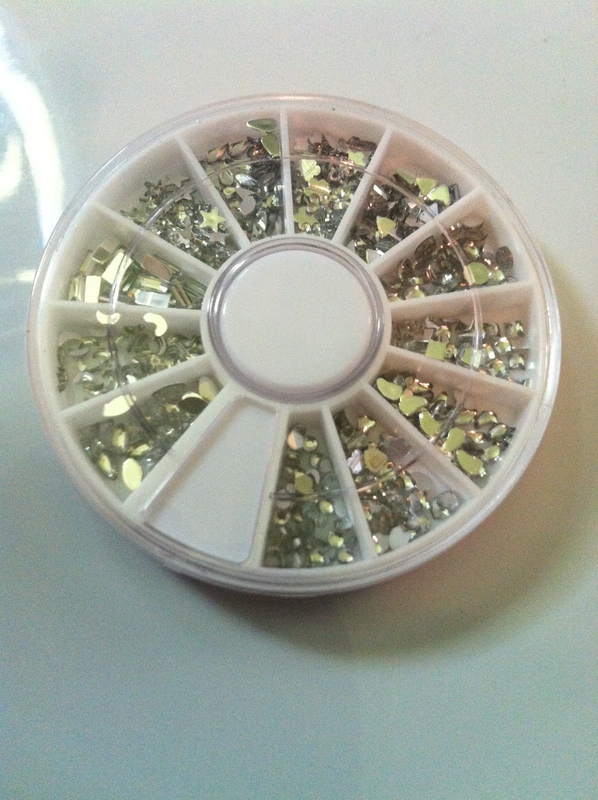 The pieces are nice and small, but not glitter. They all have a very beautiful iridescent sheen. To top it off, compared to name brand kits that run about $20, and you only get one color, I got 12 colors for about $3. 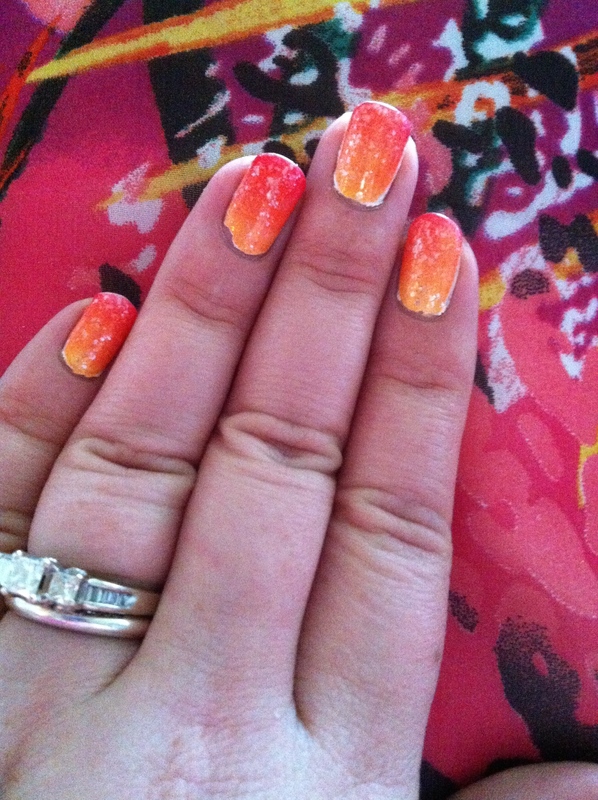 Have you used shells in any manis? Any tips before I go for it? I am not a professional nail tech. I am just someone that likes to sit at home and do her nails. 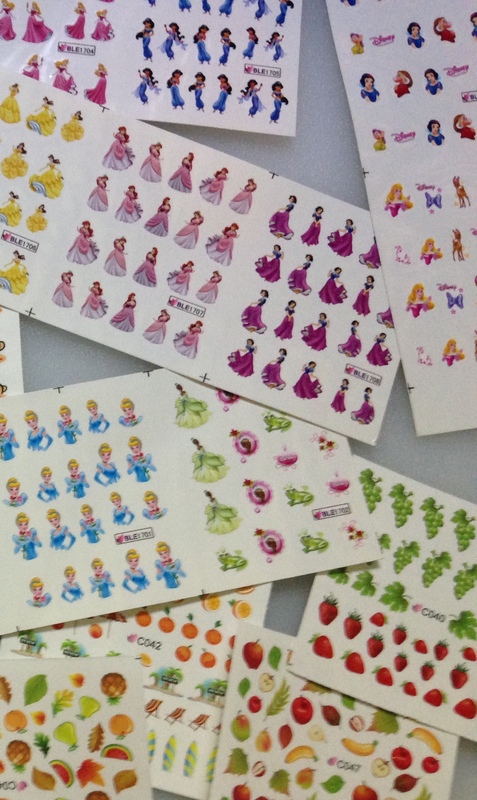 Sometimes they turn out really well, and other times…let’s just say that it’s a good thing the nail polish remover was near by. 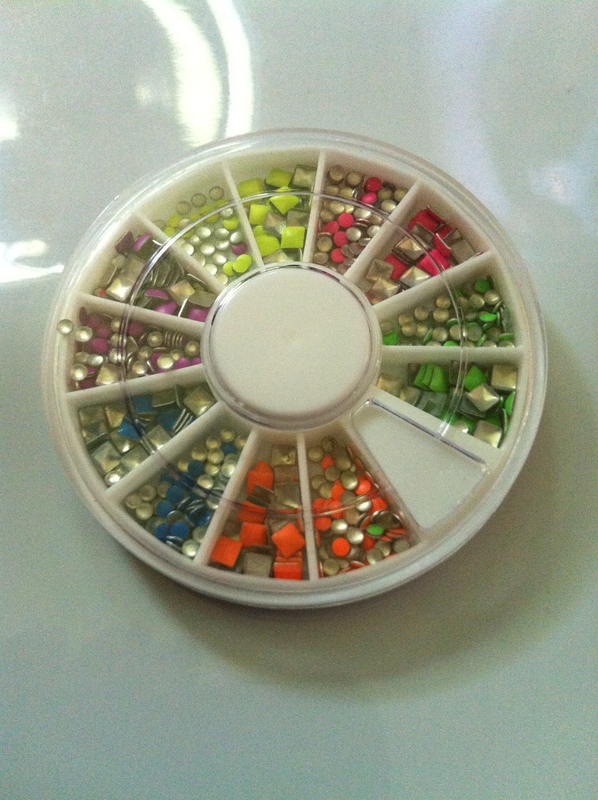 Recently, I placed an order on Amazon for all kinds of nail art stuff. It is trickling in, and I am stoked. 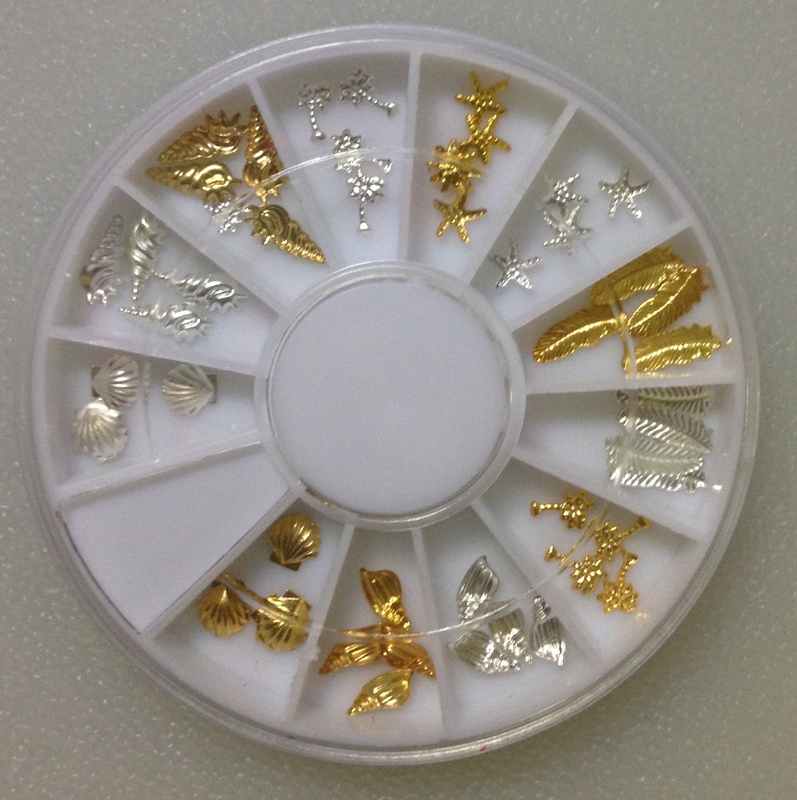 I mean, I have jewels, real dried flowers, new stamping plates, and more! I would love to post some thoughts on these products as I use them. I recently had a mini nail polish haul too. I went to Target and found tons on clearance for under a dollar, same at Ulta (and they were brands like OPI, China Glaze, etc.) and Sally’s. I love, love, love a deal! It is extremely rare that I will pay full price for nail polish (or anything really) because it feels so good to me to feel like I snagged something on the cheap. 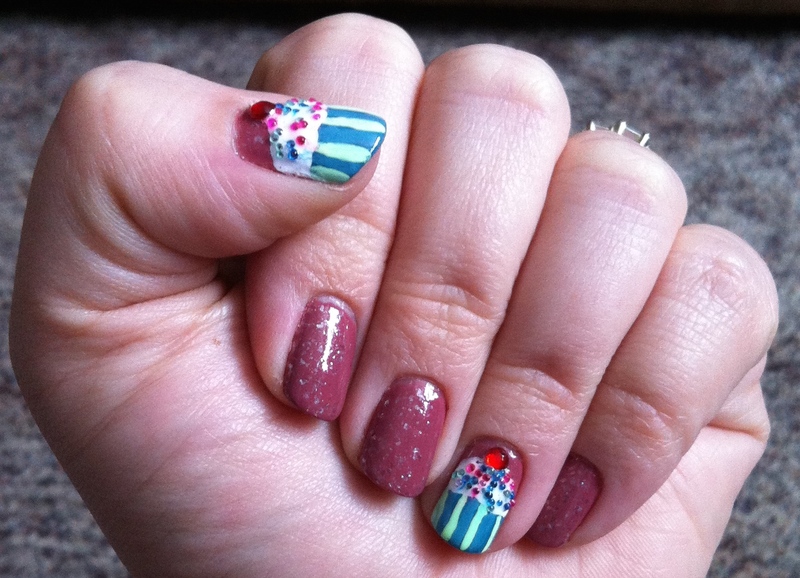 Here are a few photos of nails I have done for myself in the past. 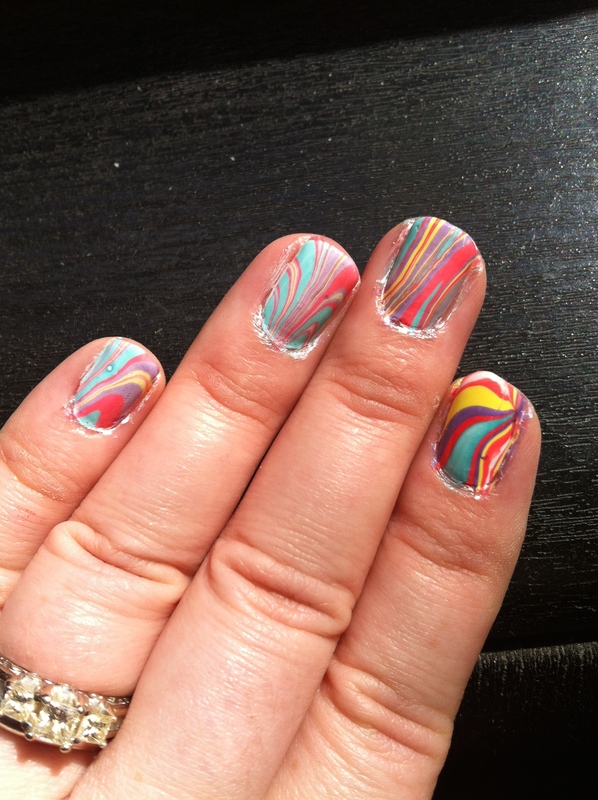 Here is a pic from my very first attempt at water marbling. I still needed to go back and clean up the edges. 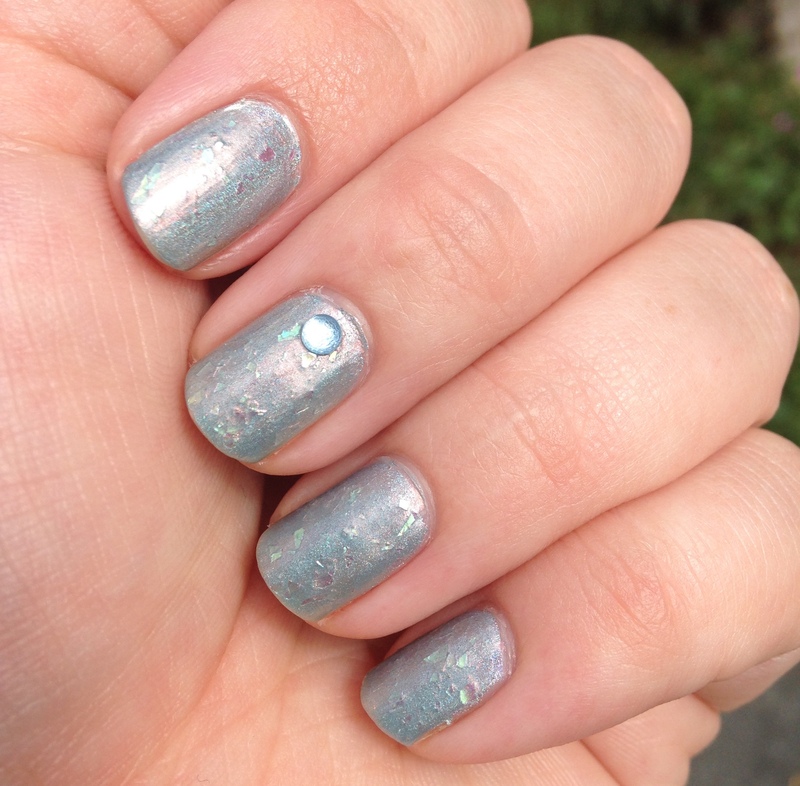 Here was some ombre sponging, with a little glitter on top. 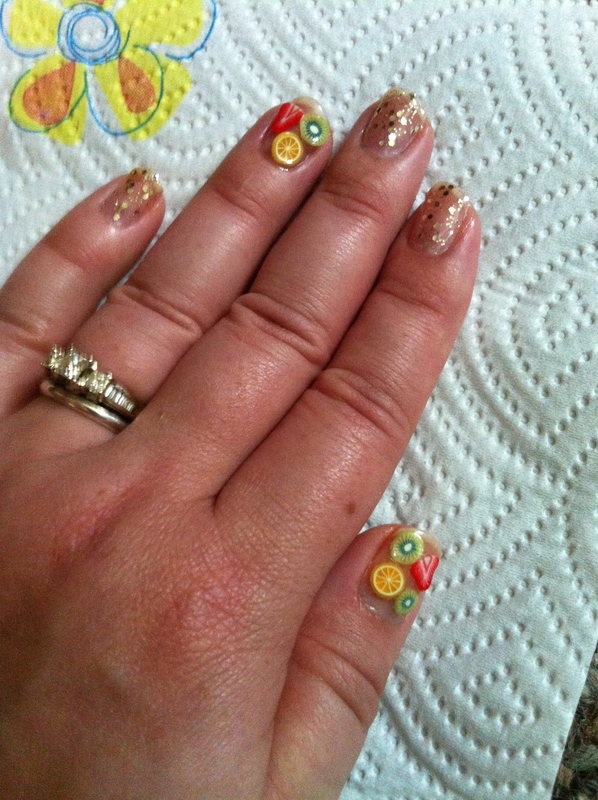 Fimo fruit nails, with some glitter on the others. 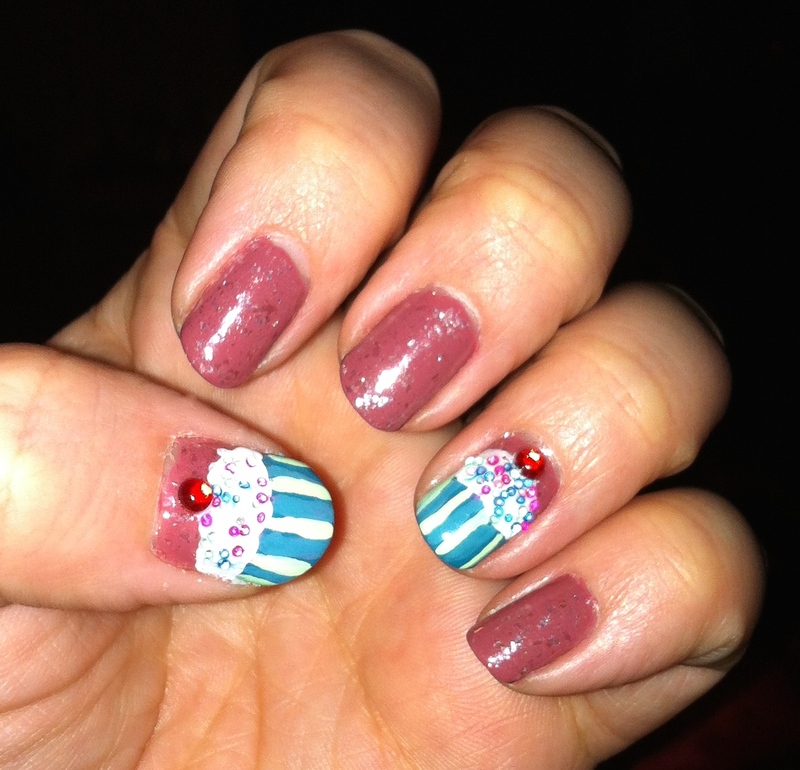 …with rhinestone and glitter piece nails. Let me know what you think! I can’t wait to get more up here! Come visit my blog, Instagram, and Twitter to see some everyday, affordable, doable looks for the average person that loves nail polish. Don't Judge Me, Okay on Happy Birthday! The big day is here. I have been blogging for two years!